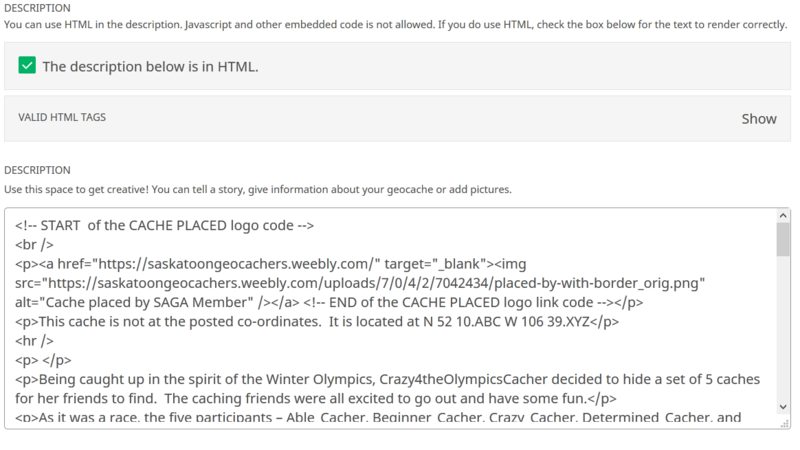 Below are a collection of logos you can use for your cache pages or your geocaching.com profile page. Copy the following html into your profile page. The image will link back to the SAGA website home page. You can access the settings by clicking on the "gear". Scroll down to the text box titled "About". This is where you paste the code. You can enlarge the text box area by pulling down on the bottom right corner. Be sure to save changes and preview your profile page. Copy the following html into your profile page. The image will link back to the SAGA website home page. You can add this logo to your existing pages. Just go to "Edit" and copy this html code into the description as I have done below.